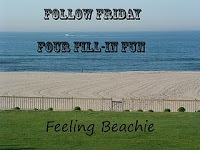 Hilary's Follow Friday Four Fill-In at Feeling Beachie! 1. I always wanted to knit something impressive and I did it! Well, it was impressive to me anyway. It was a sock. It took me FOREVER and several re-starts, but I finally did it! Now, I'm working on a baby sweater. And no, I have not knitted a mate for the sock. It was exhausting just getting one completed! You can read about that sock here. This is THE sock on Hubs' foot. Tucker just wanted to play with THE sock. 2. One of favorite things about my spouse / significant other is how handy he is. There is absolutely NOTHING that this man cannot build/make/invent/repair. The problem lies in getting him to either begin or complete building/making/inventing/repairing something. He has built a Dobro from a tree- it's gorgeous and the sound is incredible! He has built a fueling station so that we can run our vehicles with used vegetable and used soy oil. He built our raised garden beds from found materials. We never pay a mechanic to fix our cars because he can do that too. He also repairs all appliances and plumbing problems. He set up rain barrels and drip irrigation for our garden. He can do all of this and so much more but we sure do have to sit and wait for him to get around to it. Our girls are 26, 24, 23, and 19 now and they are still waiting on their tree house to be built in the Magnolia tree. Here's Hubs working on the drip irrigation a couple of months ago. 3. 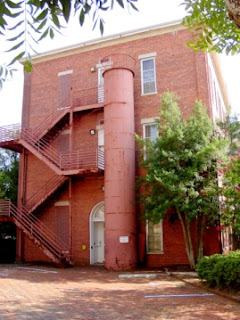 The craziest (most daring) thing I did in High School/College was probably the night we slid down the old spiral fire escape at college. You can read about that little episode at my Slip Sliding Away post. The fire escape looked like this one...only taller. 4. I couldn't make it through a day without walking Tucker. Not only because I enjoy the walking but also-- and mainly-- because he sits and stares a hole through me until I take him. Don't ever start walking a dog unless you never want to stop! This is the real reason Tucker likes to go walking every day. I've been behind with commenting this week...again...but I always enjoy a visit to your blog...I always leave with a smile and today is no exception...thank you! I would like to borrow your spouse for a weekend. Would that be a problem? I am super impressed with your knitted sock. The only problem I see with knitting socks is that you have to do two of them. My friend just knitted a baby sweater called, 'The Tulip Sweater,' and it's adorable. She did it in horizontal stripes of purple, inky blue, Kermit green, and raspberry. It doesn't button, but ties at the neck. The placket ?? is seed stitch and the rest is stockinette stitch. SO CUTE. My late husband was not handy around the house. He cooked dinner for me and did the grocery shopping but he wasn't maintenance savvy. Bruce is and I am so grateful because he has saved us a lot of money by fixing things himself. "He sits and stares a hole in me".....OH boy, my Nico does the same thing! It´s hilarious, it drives me nuts!! But it is soooo effective! I´m sure Tucker and Nico would love each other. My hubby is the same. He can build/fix anything, the problem is getting him to do it!! Desiree- I love it when you do get around here- you're comments are always so uplifting! Judy-I hate having to start over. I tried a baby blanket that was so CUTE! It had four columns of squares and inside each square was a heart. I started over three times and then, on the third time got 3/4s of the way done and had a mistake. Dang it! Haven't had the heart to start that one over yet. Tucker sends kisses! Barb- Imagine that! A hubby who can cook AND shop? Wow! LOL It really does save a lot of money! Hi! Newly following from Java's Hop! That fire escape looks like a doozy! I'll have to go read about it! I can't knit to save my life, so Brava on THE sock! Hope you get a chance to stop by and say hello! Have a great weekend! Mrs. B-Thanks so much for the comment and the follow! I'm heading over to your place now! Love the sock. I crochet and hope to one day learn to knit - It's on my list of things to do/learn after my last birdie leaves the nest. 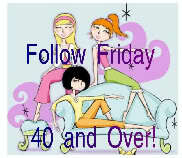 I'm here from: Follow Friday 40 and Over!! I'm also your newest follower. Mona- Thanks so much for the visit and the follow! I'm on my way to return the favor! Crochet? I have never been able to figure out how to do it. This summer my husband and I officially become empty nesters, so I am happy to find your site through the Blog Hop. I will become a follower and I hope you will visit my site and follow me as well...we can work through this new phase together!! Pam-Thank you so much! I feel like I'm commenting to myself-I'm Pam too! LOL Heading to your blog now! I love that you made only one sock. I love to crochet, but I am like your husband with my projects. I start, and then something interupts me and I never finish. I have been making the same sweater for two years! I used to crochet, cross stitch, and quilt, but don't do any now. should get back into it now I have way more time! My linky is up, I'd love to feature you as #2.